I wanted to thank-you for helping me choose and buy my new C3 Aircross from Warners (Tewkesbury). This is the second car that you have sold me, but my first brand-new car and, as always, your product knowledge, attention to detail and ability to explain finance options in an easy to understand manner, made it an outstanding customer experience for me. I'm so pleased with my Aircross and my friends have all commented on how much they like it. 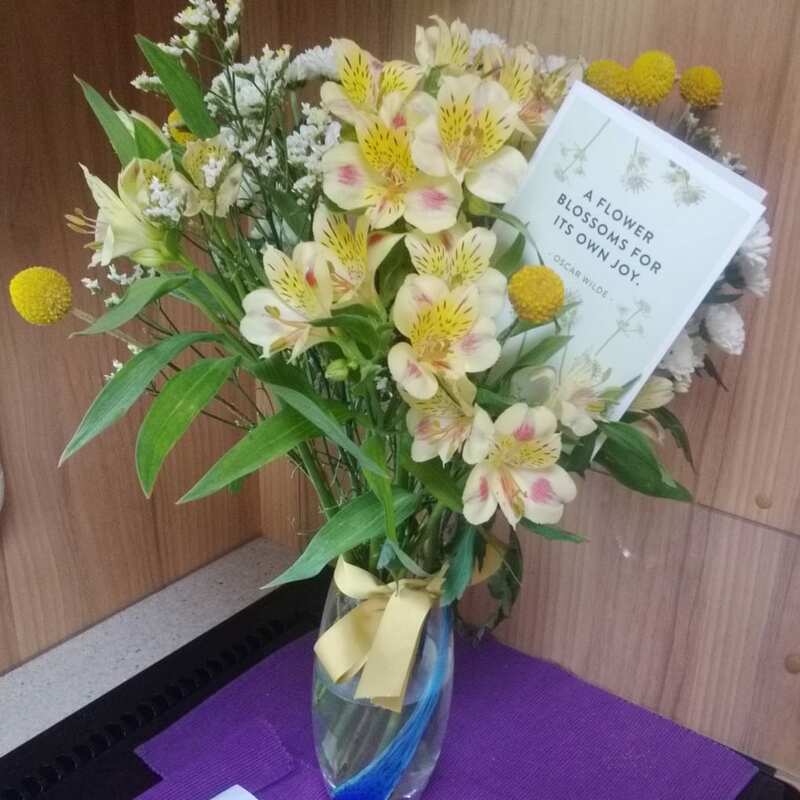 And finally a big thank-you for the lovely flowers that I received through the post, it was a lovely gesture which I really appreciated. I will recommend Warners Tewkesbury, and you of course, to all my friends, colleagues and neighbours without hesitation. I received a letter from Peugeot advising that there was a recall on my car to have work carried out, and I duly booked my car into your garage. On arrival at the garage in Gloucester, a very helpful member of your staff kindly showed me to the Service Desk so my car could be booked in. The Assistant on the Service Desk was Gill Hyett. She was very polite, helpful and courteous, a credit to your garage and she certainly is worthy of a special mention. The mechanics did a very good job on my car and credit must also go to them. I was advised that additional work is needed on my car, and because of Gill’s helpful and courteous manner, I intend coming back to your garage to have this particular work done. It was first-class service all round and I would certainly recommend your garage. I’m writing to thank you following my latest service and repairs carried out to my Citroen dispatch. The young lady that I dealt with was called Lizzie, she was very friendly from the offset with a beaming smile. She was also very helpful and courteous, I was called in afternoon following my service and told that some works needed to be done and that I could keep the courtesy van until the following day allowing yourselves to carry out the repairs. When collecting my van this morning I was met by the same beaming smile and courteous, bouncy and positive behaviour. I just felt that I needed to write to you and let you know how good of an experience I had and look forward to my next experience with a member of your team. From walking into the showroom, you engaged with me in a professional and open manner. You made me immediately feel at ease, helping my with the required forms. On understanding that I was going to be waiting for the service, you directed me to a seating area (plush one), made sure I was ok for refreshments and was clear that I could approach you if I needed anything. During my wait, you kept me regularly updated with my car’s progress. You checked on my wellbeing, you made sure I had enough water or refreshments. As I was working during my wait you checked if I needed a comfort break and offered to keep my bags safe, if I need to. Upon the service being completed, I was informed by you of the outcome of this and was kept up to date in regard to the service car wash that my car was waiting for. The car wash person was on lunch, and was due back shortly. I was due to be back at work in order to complete calls. Your office was unusually quiet and so in your final example of what make you a ninja at your job was that you took this quite time to clean my car. I hope that your manager and their managers understand how hard you work and how good you are at your job. If you can take one compliment (you deserve so many more) from this. Every day understand how completely fabulous your are at your job. Warner’s are incredibly lucky to have you and I hope they understand this. Having had the joy of my new-ish (61 plate) 508 for a couple of months now, I wanted to take the opportunity to write and say how much I am enjoying the car. It does me another 175-225 miles on a tank compared to my old 407, and while that's in part because it's a slightly larger tank, it's also down to the efficiency of the engine. I appreciate the slight lightening on my monthly budget! I also wanted to take the opportunity to note the patience of Craig in helping me select a car that met my needs. It took me a couple of years before I finally made the decision, but there was no pressure at all from Craig, just an understanding that my situation at the various points of time militated against a purchase. He also made sure that we worked through a number of different options in terms of models, and prices so that it was clear that I was getting the car that I needed, and not the one that would give him the best sales figures. I am very grateful for the help provided by Craig and the manner of his assistance. One of the key reasons that it took me so long to purchase a replacement for the 407 was the excellent work that Gary and his Service team put in keeping the 407 going well past it's natural life, and at a cost that enabled me to delay any replacement. It was only the threat of the forthcoming Cam Belt change that tipped the balance in favour of replacing the 407. You have a good team at Warners, and I don't hesitate to mention that fact when my conversations turn toward motoring. “I recently took delivery of a Peugeot 3008 GT-Line as a company car and, as I know that people are often very quick to complain, I’d like to express how delighted I am with the service provided by your sales team, specifically Steve Wilkinson, as well as Rob in your service department. Having worked for most of my working life in and around the automotive sector, starting as a car salesman selling Jaguar / Rover / Triumph in the ‘70s, spending quite some time in zone and regional sales and marketing roles with VMs, through to now being involved in vehicle emissions technology, I have experienced the motor trade and various dealers both from within and without and had been left with the feeling that proper customer service had been eradicated. I was wrong, at least insofar as Warners Peugeot are concerned. I looked at other brands and had my previously held view confirmed by (other dealers), but I kept coming back to the 3008 and to Warners. Steve was professional without being pushy, he provided all the information I needed to put to my employer and then, once the deal had been signed, went out of his way to ensure that all went well up to and including the handover. Today I had the, somewhat belated, 1,000 mile check carried out and yes, Steve had reminded me to get it done, and this was accomplished with absolute professionalism by Rob, who kept me informed of progress on the SatNav update as I waited and did some work on my laptop. As I was leaving, Rob also offered, as we live on the same road, to collect my car on his way to work if ever I need to have it serviced whilst I work at home. There’s not really very much more to add, so I’ll just say well done! Thank you so much for helping me to make my decision when selecting new 3008 vehicle - not only this morning but on several previous occasions. The standard of service I have obtained from the staff at Warners over many years has been quite exceptional, unfortunately this kind of help in many of our retail outlets seems to be lacking these days. I look forward to hearing from you nearer the time of delivery and hope you can obtain and register the new vehicle before the road tax increases on 1 April 2017. Many thanks again Matthew and I look forward to hearing from you. Absolutely delighted with our new 2008 recently purchased from Warners, Gloucester. The whole experience was superb thanks to your salesman Paul Coughlan, who was exceptional throughout the transaction; he proved to be knowledgeable, courteous and professional at all times. I just wanted to say a big thank you to you and the guys. I very much appreciate how you and the service team helped me today. Fabulous customer service is rare these days, but you provided that to me, and really exceeded my expectations. Thank you all. Hoping that you all have a very Merry Christmas and the very best wishes for 2017. I just wanted to say just how happy I was with the service I received from your parts and service department. The service was exceptional, especially from Richard, one of your mechanics who went out of his way to try and sort out a difficult issue with my car - saving me a great deal of time and effort. Richard, really provided exceptional service and I will ensure that in the future I return and use your garage for all repairs and when thinking of purchasing another car. I also wanted to quickly mention Gill, who ordered the parts for my car and also went out of her way sorting out a difficult situation with the garage i originally purchased the car from and it was only due to her persistence in contacting the garage several time that the issue was sorted out and I was very grateful for her help. I would like to inform you that I am absolutely overwhelmed with the customer service myself and my partner have received from one of your sales team, Matt. What a lovely, genuine guy. I have never been so impressed with service as have with Matt's. I would like to write in to explain why I am so happy and why I would now recommend your company. Please inform the best way I can do this, as I would like your company to know how fantastic Matt is! Thank you. Thank you for looking after my car and me when the clutch went. As my husband is ill and is now in Sue Ryder Hospice I needed the car urgently and you repaired it in a day. Warners of Tewkesbury is not just about cars but about caring for customers. Further to our conversation on Friday, I should like to compliment your staff on their professionalism and customer care shown to me when I attended Gloucester both on 30 Sept and 14 Oct; they listened to my concern, advised me on the action to be taken and were very pleasant in their communications. Please congratulate your colleagues from me. Thank you for your help and the coffee this morning. I await your confirmation of my booking. May I reiterate my earlier conversation that I find the staff in Gloucester very helpful, courteous and kind. Thank you for good service. We left home on Friday morning to head for North Yorkshire. Just before we left the postman arrived with a box set of beautiful flowers. I have attached a photo for you to see them. This was a lovely gesture on your part and totally unexpected. It made both of us feel quite touched by your kind words. Our sincere thanks to you and Warner's. It underpins the quality of the service that you provide with a distinct indication that you will go that extra mile even after the deal is done. Thanks again Steve. Have no fear, we will be back. As I said when we last spoke; we are so pleased with our new Peugeot 308. It is a drive to die for. Mr C would like to pass on his thanks to James and Paul for all the help they gave him when he called in at the weekend after he had had an accident; he said their help was very much appreciated. Paul has provided exceptional service, making the whole process extremely simple. He has kept me informed with daily calls and nothing has been too much trouble.